If you don’t have access to a supplemental oxygen canister, you might want to hyperventilate before listening to this demo we’re about to serve up. Having eye-drops nearby would also be a good idea, so your orbits don’t dry out when they pop open and stay that way. A bib might be advisable, too, unless you don’t mind drooling on your shirt. I’m just trying to be helpful. You might thank me later. 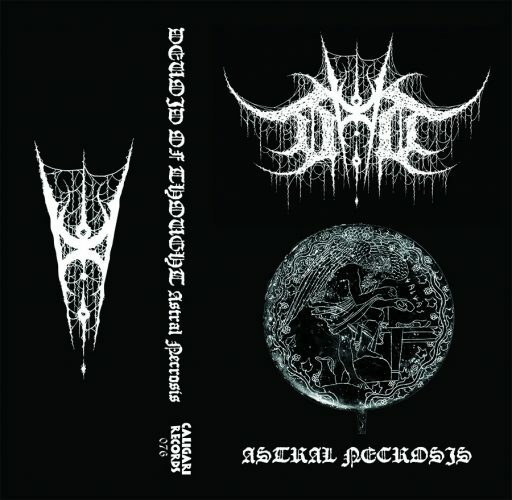 Astral Necrosis will be released by Caligari Records on October 21, and we’re damned fortunate to introduce you to a full stream of the music right now. We’re told that Devoid of Thought was first spawned around 2010/2011 in Busto Arsizio as a thrash metal act called Warstorm, which released a debut album in 2014, but then after some line-up changes the band (which now includes a member of Fuoco Fatuo) altered both their sound and their moniker and are now forging ahead under the banner of Devoid of Thought. 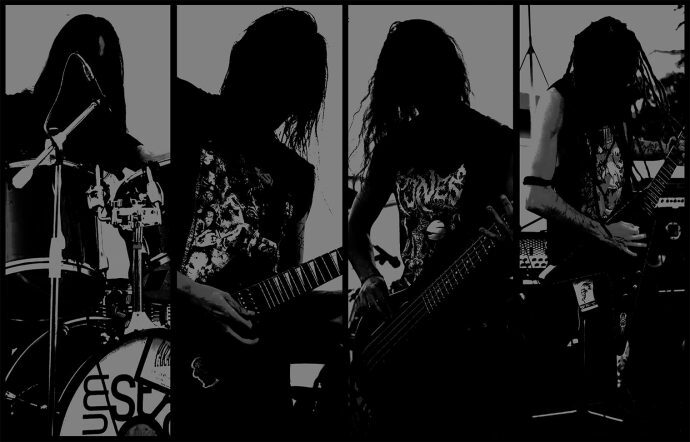 In genre terms, Astral Necrosis is a whipsawing amalgam of death metal and thrash, with the kind of fireball instrumental performances and brain-spinning intricacy that might lead one to slap a “progressive” label on the ingredients as well — except it somehow seems too maniacal and vicious for that word. At first blush, everything about the demo might strike you as rough, raw, and abrasive — from the borderline lo-fi quality of the production to the murderous, guttural cruelty of the vocals, straight through to the cacophony of shrieking and twittering feedback that brings the final song to a close. But it soon becomes apparent that there is nothing rough or raw about the performances — the production isn’t so gnarly as to obscure the jaw-dropping technical skill of the performers, or the magnetic quality of the riffs. The opening track, “Hepatoscopy“, is the most explosively kaleidoscopic of the three. It includes a multitude of distinct drum rhythms and tempos, and the band veer back and forth among them at a breathless rate while boiling the listener’s brain with superheated guitar leads and creating sensations of tyrannical ruthlessness. It’s a wonder that the whole thing doesn’t completely careen off the rails and explode in a nuclear mushroom cloud of fragmented instruments and charred body parts. And yet, amazingly, the song is also catchy. “Necrotic Surface Discarded” isn’t quite as insanely multifaceted as the first track, but it’s still as turbocharged as a giant dynamo, matching a big jackhammering groove with maelstroms of near-chaotic, dual-guitar frenzy, and dishing up flurries of double-bass pummeling and skull-cracking snare beats. If you haven’t taken any deep breaths by the time you reach the third track, “Sidereal Breath“, you’ll have no chance for one until it ends. It’s the most maniacal and blindingly fast of the three — a rampage of syncopated rhythms and riffs, bursts of double-bass, spurts of crazed lead guitar flourishes, stomping grooves, and feats of lunatic soloing that are almost inhumanly fast. As is their wont, the band switch rhythms in breathtaking fashion, and the combined effect of all this is disorienting. You feel like a passenger in a cyclotron whose path has been twisted into knots. In a nutshell, Astral Necrosis is insanely good… as well as just insane. Caligari Records will release it in a limited edition of 200 pro-tapes. Pre-order via the link below… and don’t waste time, because this one ought to sell out in a hurry.